In America, September 26th is Johnny Appleseed Day. Most people are unaware of this historical date; unless, you are an elementary school teacher. As a former elementary school teacher, I looked forward to Johnny Appleseed Day each year. We studied the life of John Chapman, a nurseryman, who traveled across America planting apple tree orchards along the way. Johnny Appleseed Day at school was filled with apple-inspired activities, but my favorite activity was making homemade applesauce! Each child would bring in their favorite apple from home. We would peel the apples, cut them, and stick them in a crockpot. We would add a handful of "red hot" cinnamon candies, set the crockpot to high, and smell the heavenly scent of apples and cinnamon cooking in our classroom. At the end of the school day, I would spoon the pink-tinted applesauce into small dixie cups. Everyone got a sample of the warm, cinnamon-flavored applesauce and it was yummy! Over the years, I have continued to experiment with crockpot applesauce recipes. The great thing about crockpot applesauce is that it is difficult to go wrong. Crockpot applesauce recipes use few ingredients, are simple to make, taste delicious, and make your house smell scrumptious. When I began making applesauce, I wondered if there was a certain variety of apple that was better to use than another. Truth be told, any apple can be turned into applesauce. However, many recipes call for a combination of apple varieties, which many people believe creates the best flavor. (Perhaps this is why our classroom applesauce always turned out so good!) Other people recommend using softer apples because they cook faster. And of course, choosing which apples to use may just come down to a matter of preference. As I've sifted through various recipes, popular applesauce apples include Fuji, Gala, Golden Delicious, McIntosh, Braeburn, Jonagold, and Honeycrisp. Once you've selected the apples of your choice, it is time to find a recipe. I came across this crockpot applesauce recipe a couple of years ago and we really enjoy it. Peel, core, and slice the apples. Place them in a slow cooker. Add the lemon peel, lemon juice, cinnamon stick, and brown sugar. Set the crockpot to low and cook for 6 hours. Remove cinnamon stick and blend with an immersion blender until smooth. It's as easy as that! 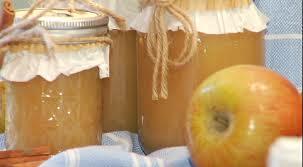 Tasty, fragrant, Johnny Appleseed inspired applesauce. You really can't go wrong!